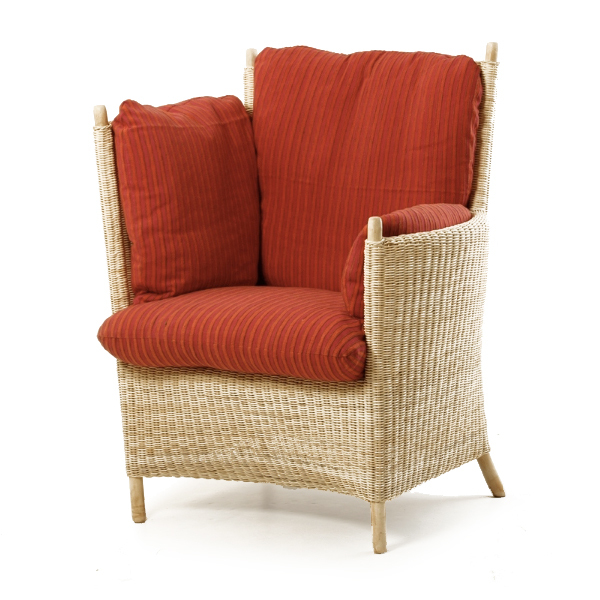 Cocooning, super-comfortable, and stylish – perfect for modern garden-rooms, and light airy spaces. 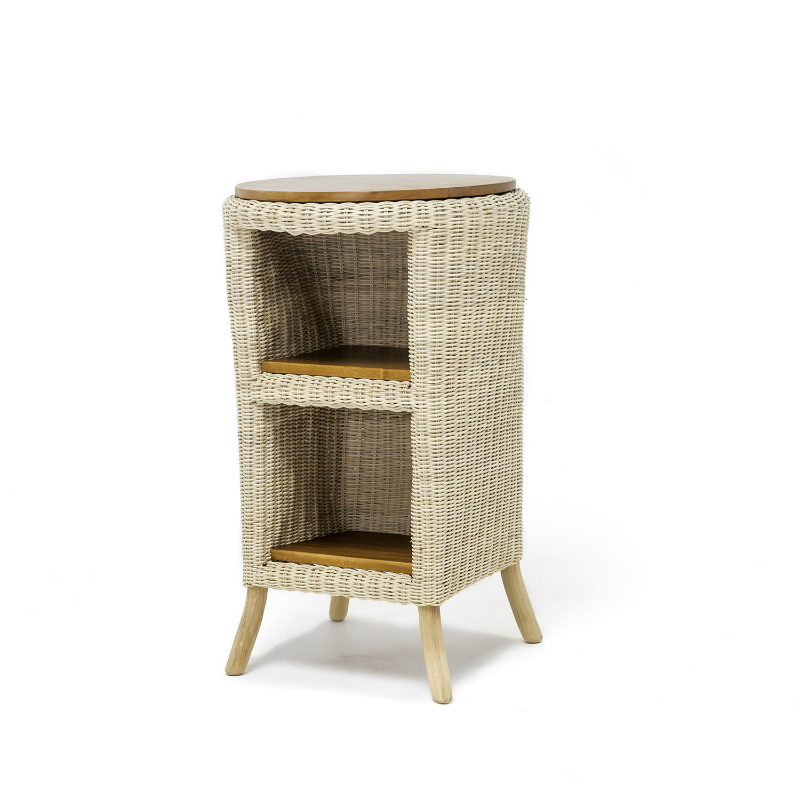 The wrap-around high-sides of the asymmetrical Jogya chairs embrace you, while the low sides create a practical space for your drinks station! 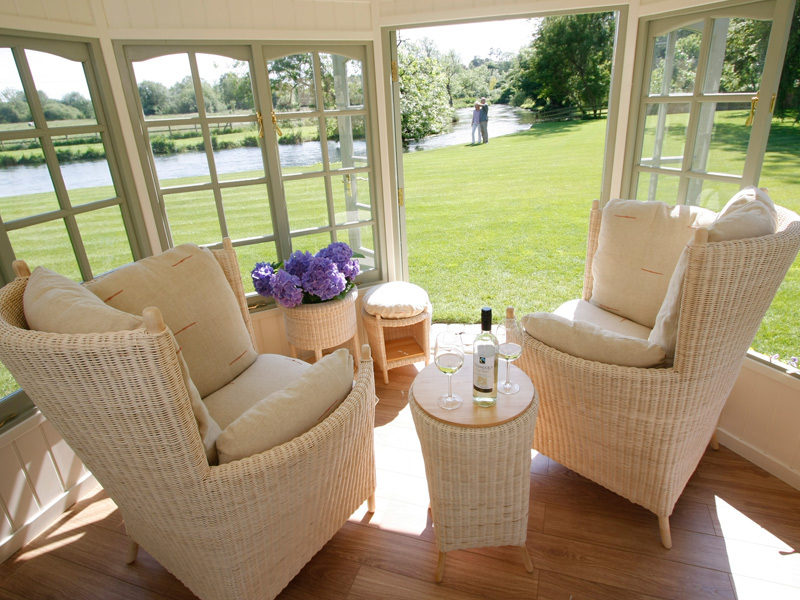 Left and right chairs combine to make a wonderful space for chatting and relaxing. 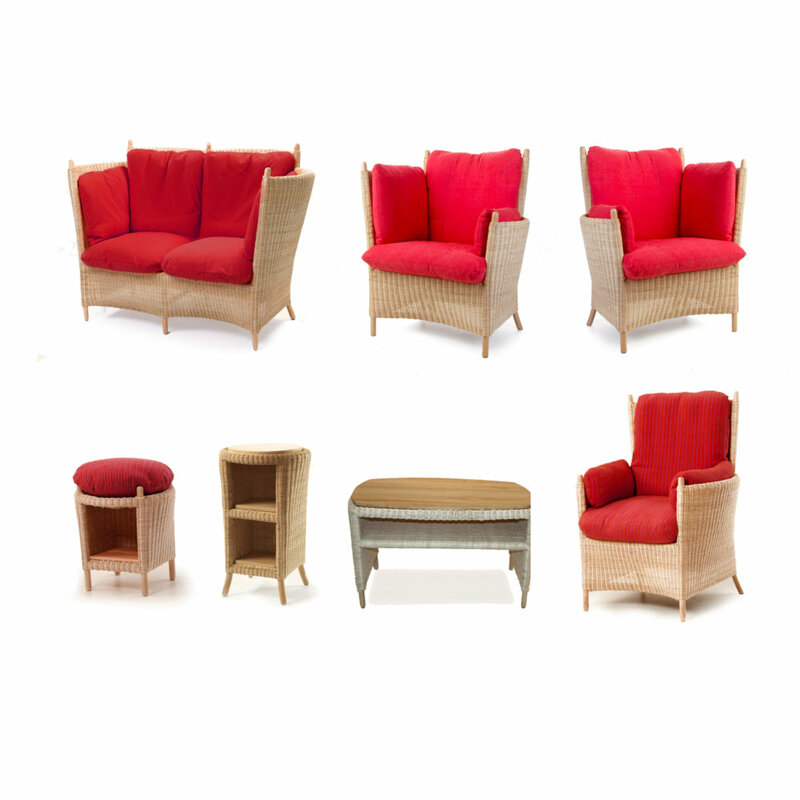 The sofas and symmetrical chairs allow you to make up a suite for whatever number you want to accommodate. 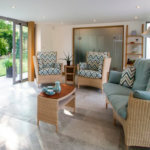 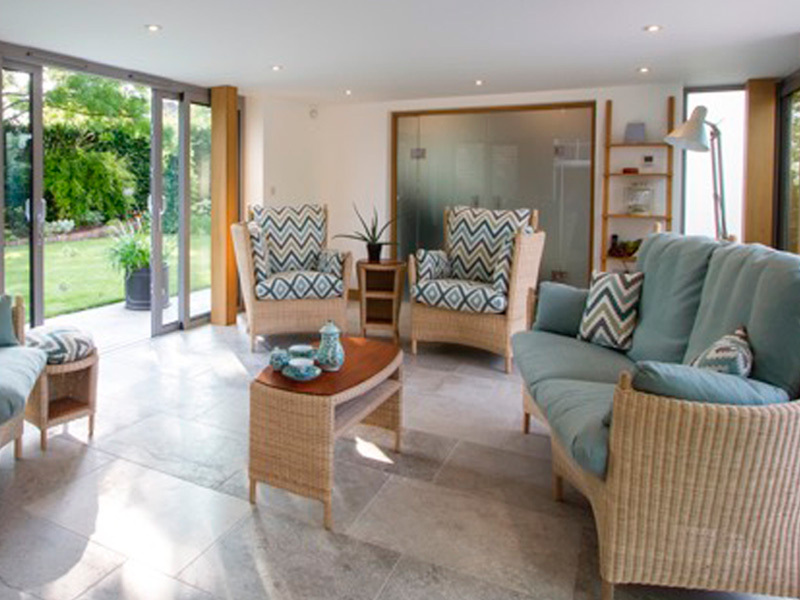 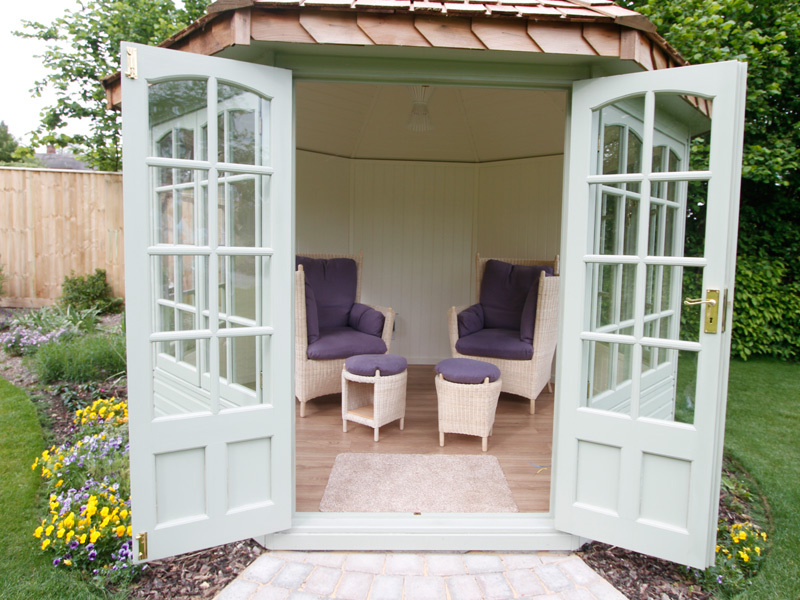 The Jogya range works well in a number of different situations and settings; from two chairs in a small summerhouse to a grand modern garden room. 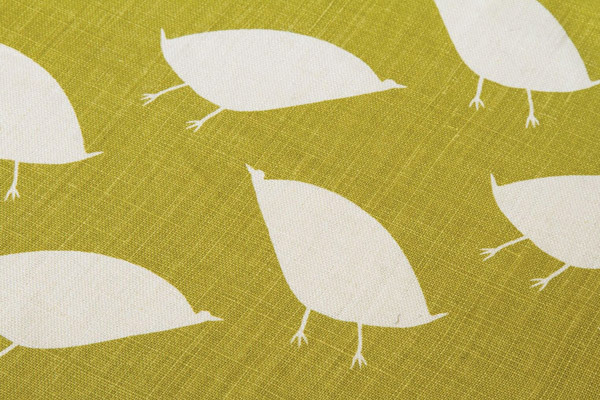 And with all the fabric options available, you can easily personalise the design to suit your individual taste. 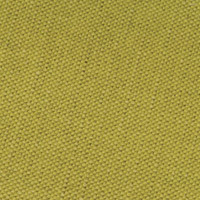 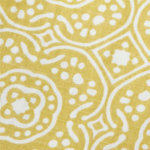 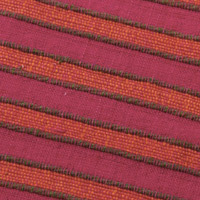 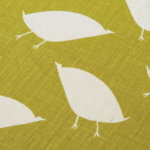 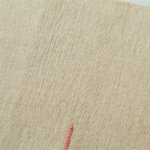 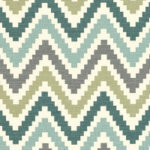 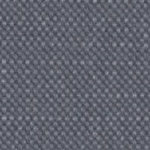 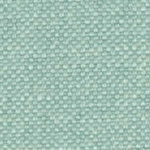 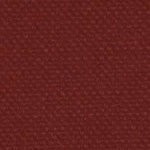 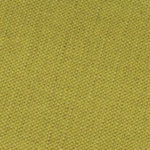 This gallery shows a selection of our more popular fabrics. 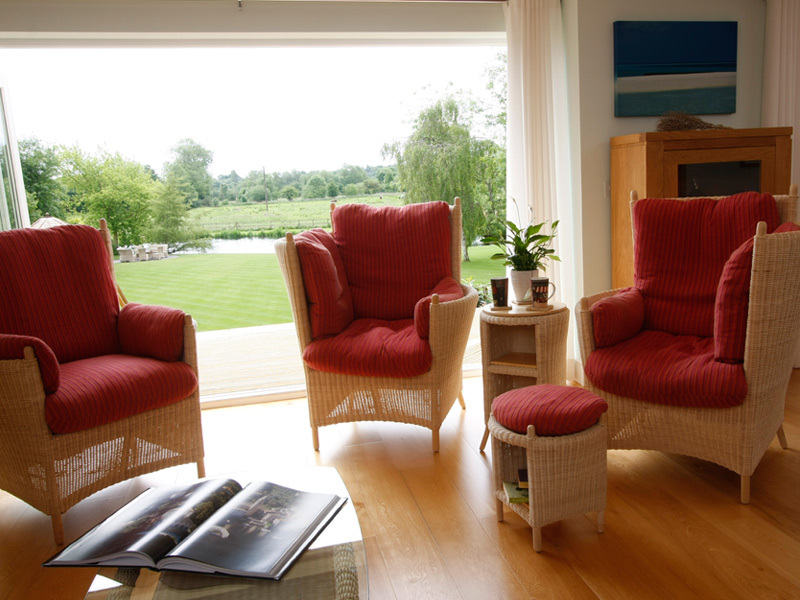 The individual chairs are left or right-sided. 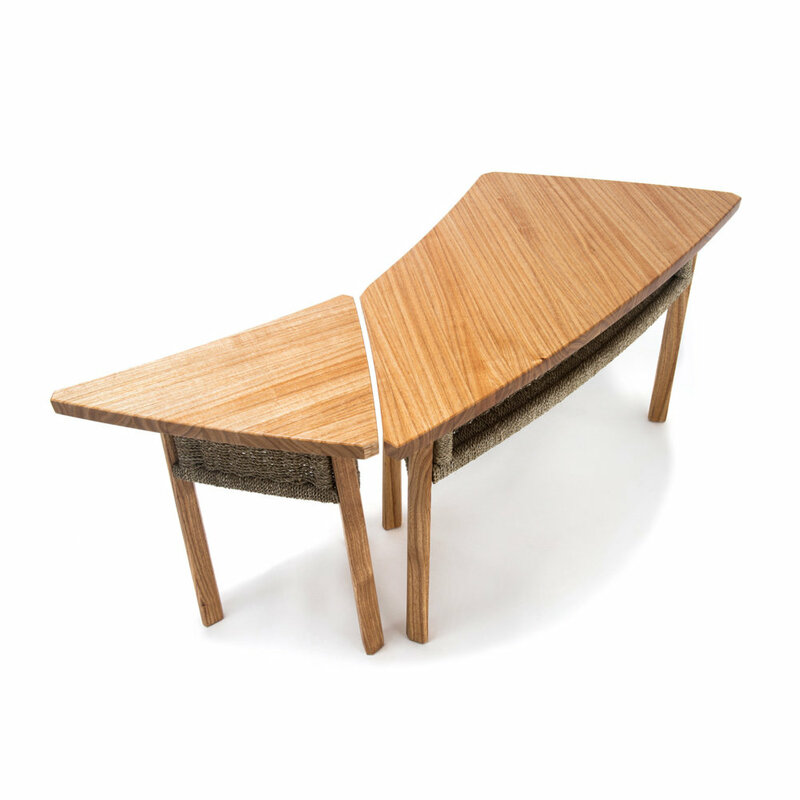 Two chairs make a symmetrical pair. 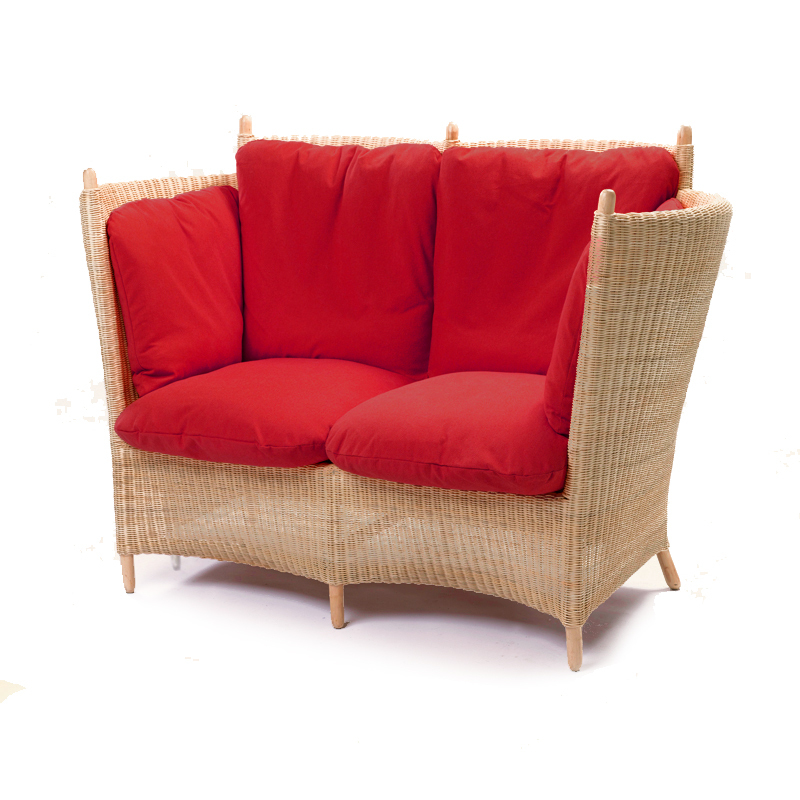 The two-seater sofa is cosy, perfect for you and a loved one, or for your guests. 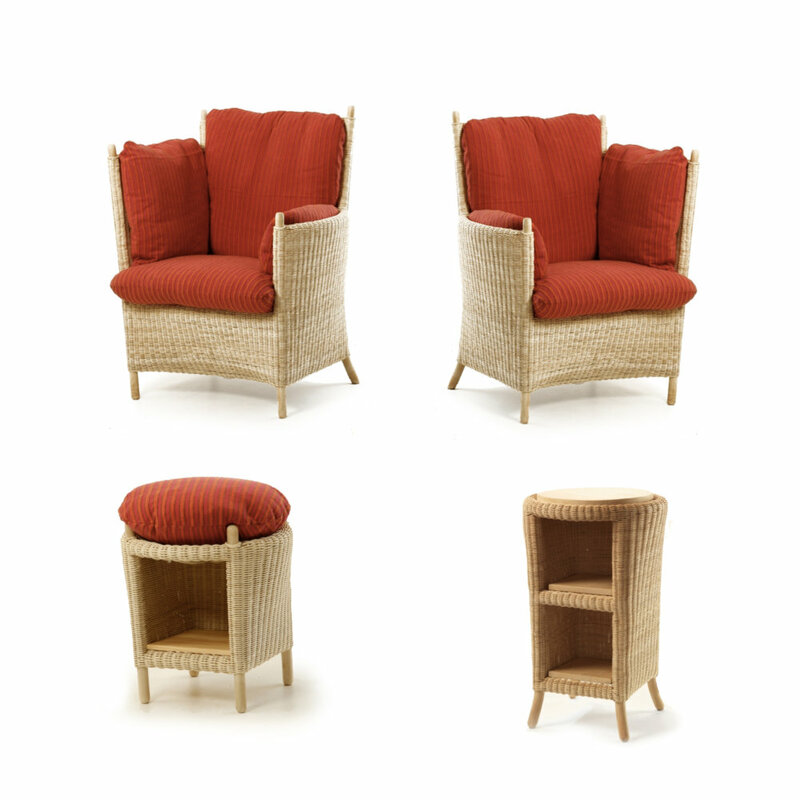 Shown below are the two sets most frequently chosen by our customers. 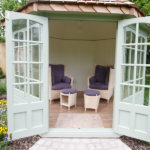 The 4-piece set is perfect for a couple, and suits smaller spaces like summerhouses and traditional conservatories. 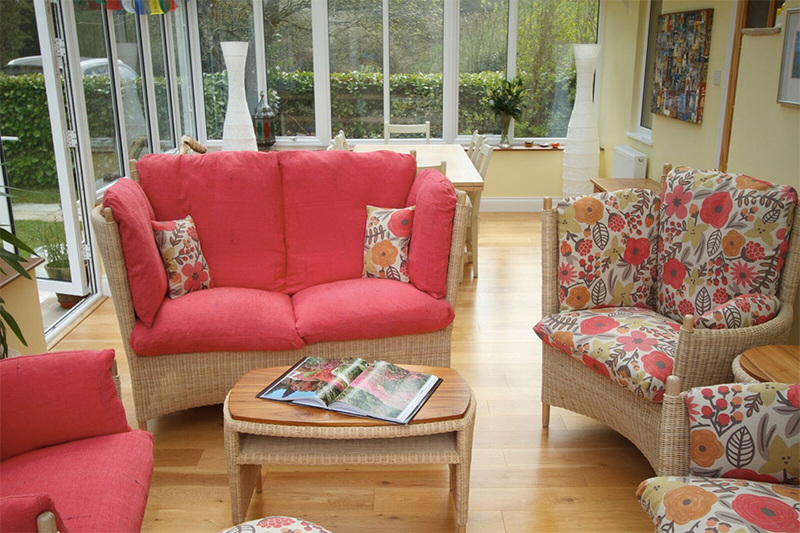 The larger sofa set works brilliantly if you want to seat 5 people and have a bit more space to play with. 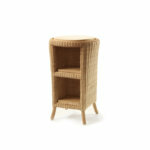 You can of course also add tables, stools and any other accessories to your purchase. 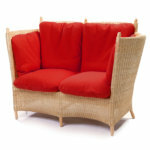 Categories: Jogya, Modern Garden Room Furniture, Open Plan Living Furniture, Summer House / Garden Building Furniture. 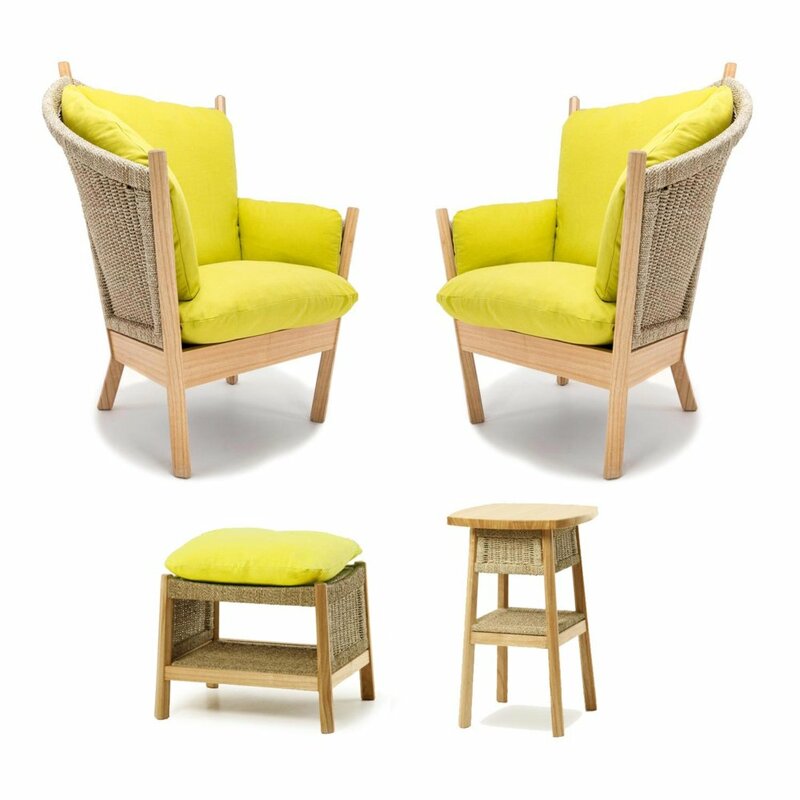 This set is our most popular combination – perfect for two people wanting to enjoy plenty of feelgood moments together! 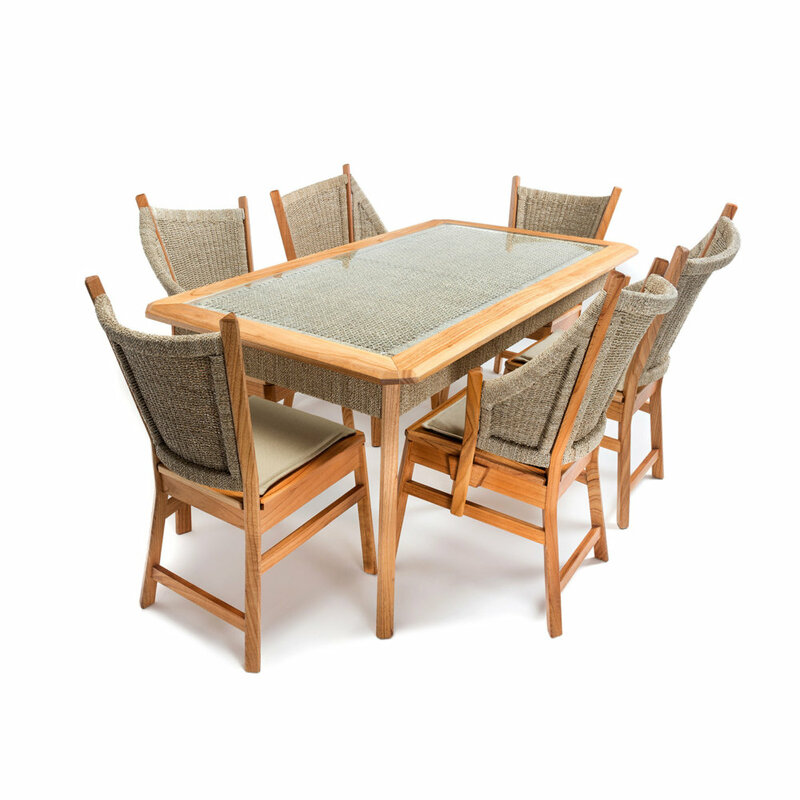 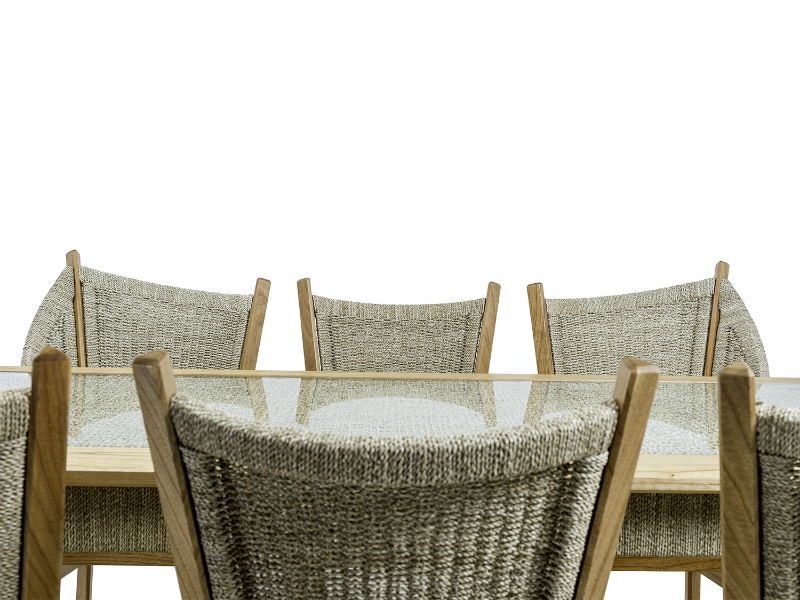 The chairs feature Tord Kjellstrom’s unique asymmetrical design: with one side high, the other low. 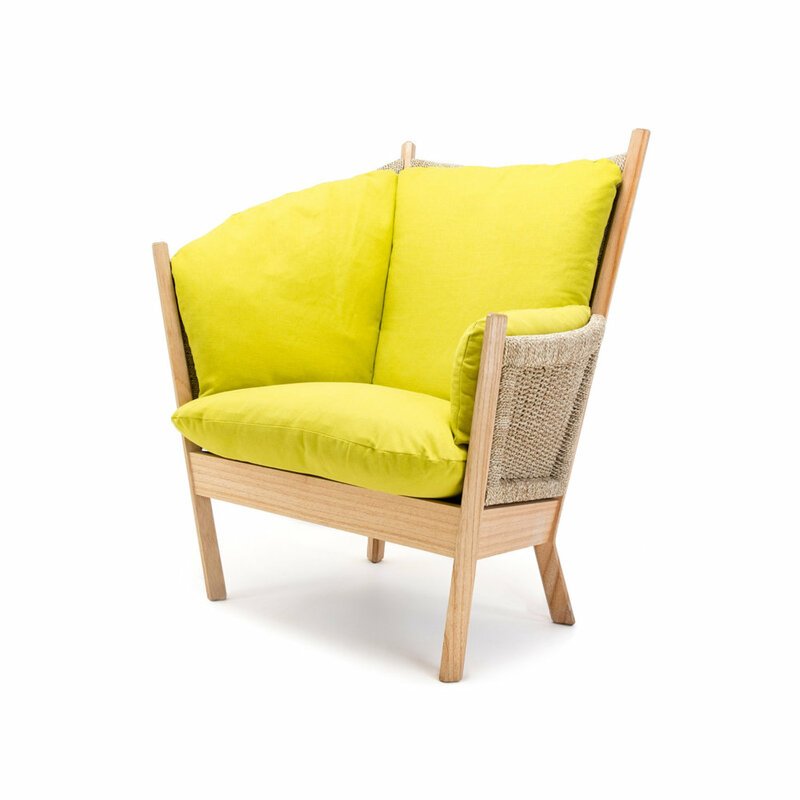 The high side provides a cosy corner for you to snuggle into, while the low side is the perfect height for reaching your drink. The side table fits neatly between the chairs, an ideal home for that bottle of wine and a couple of glasses! 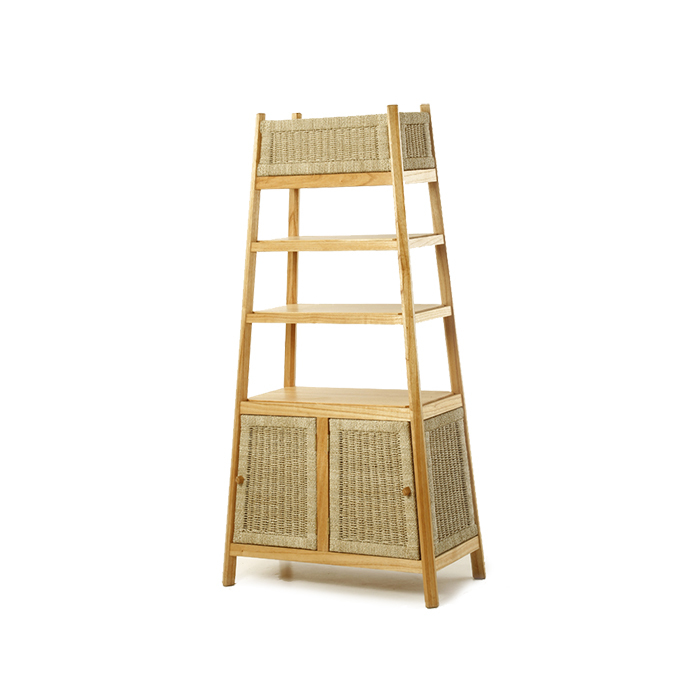 It has two neat shelves to provide useful storage. 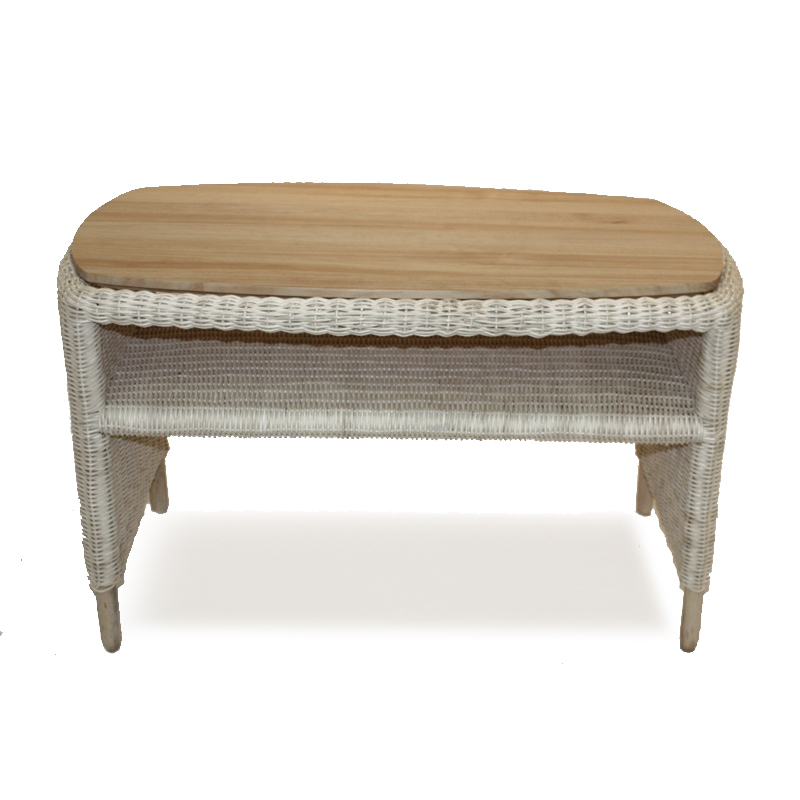 The footstool adds a touch of real luxury to the sitting experience; it’s also good as an occasional seat, or as a low table with the cushion removed. 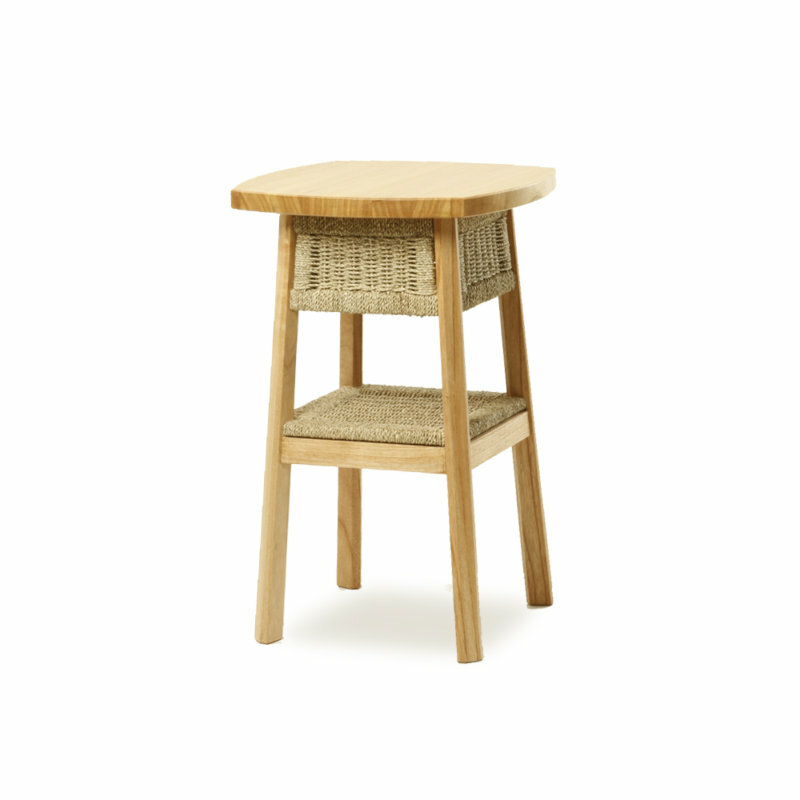 There is a shelf underneath for handy storage space. 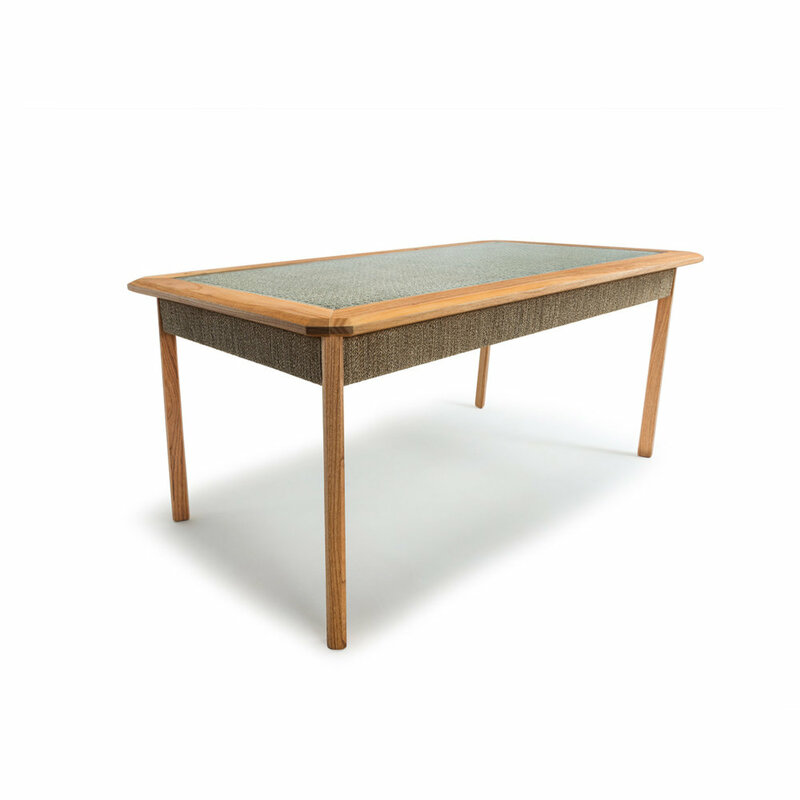 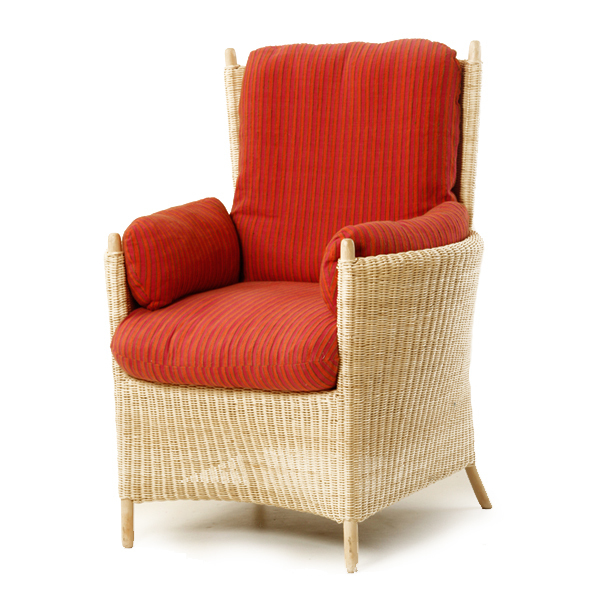 The main material used is rattan. The chair and table skeletons are made from a structure of rattan poles, while the wickerwork uses fine peeled rattan. 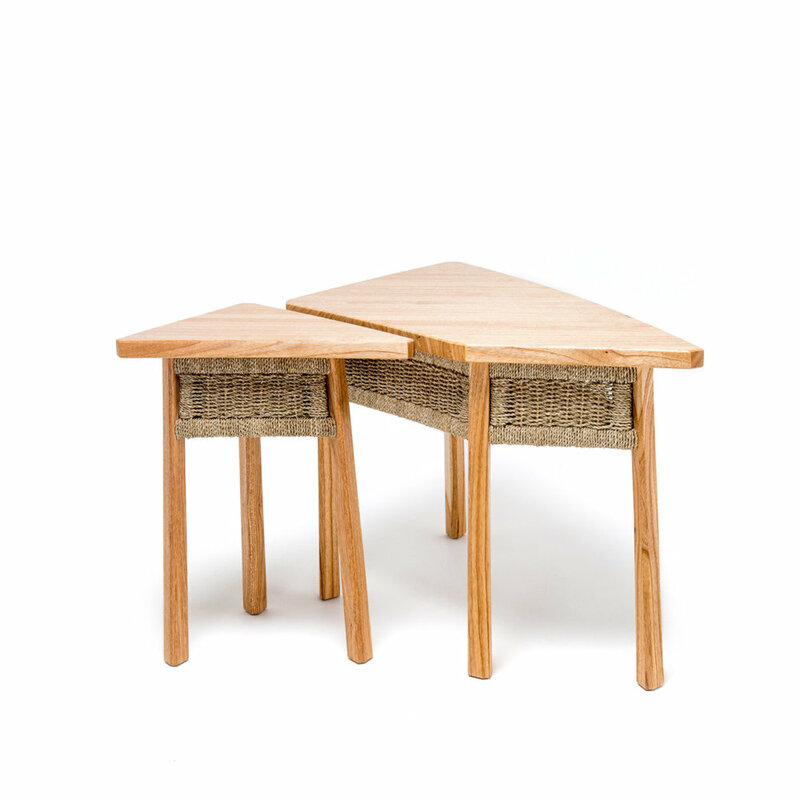 The wooden elements are made using FSC-certified teak and acacia (for seat-frames) and mahogany (for shelves and table tops). 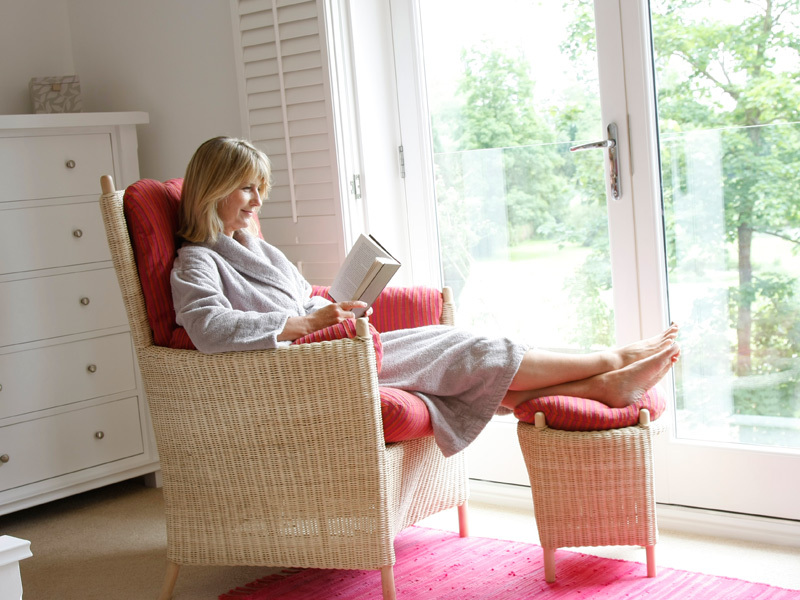 Feather cushions are added here in the UK for luxury and comfort. 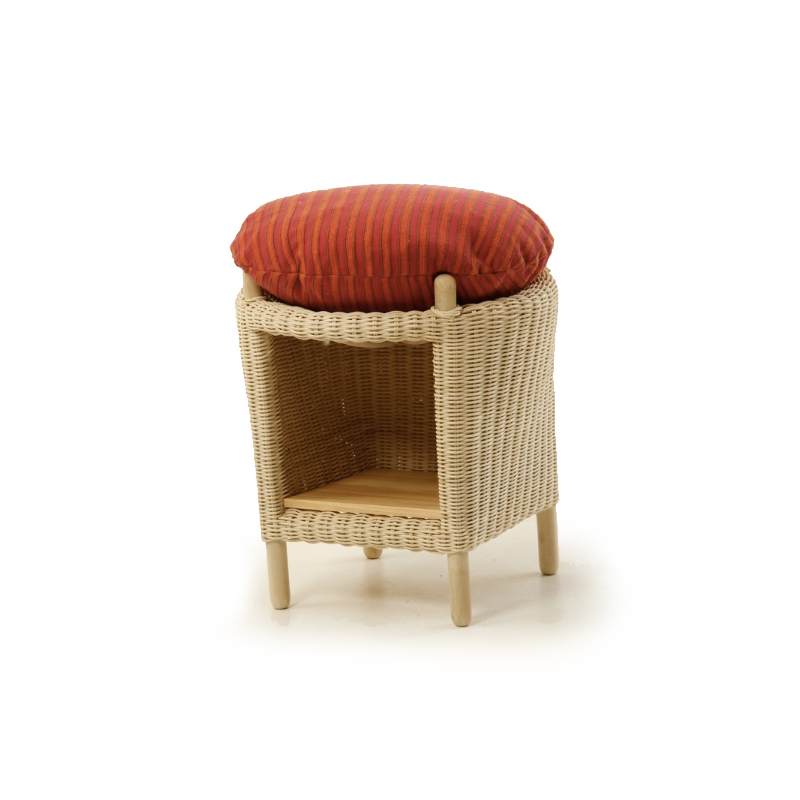 The seat cushions feature a feather down and foam sandwich to make them more supportive. 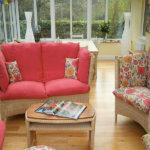 This is a fabulous suite for anyone looking to seat 5 people in great comfort and style. 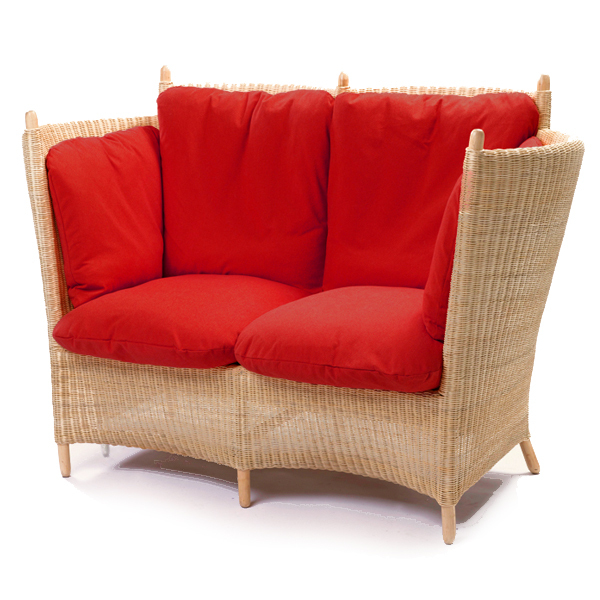 It features a two-seater sofa, a pair of quirky high-low chairs, and a single chair with matching accessories. 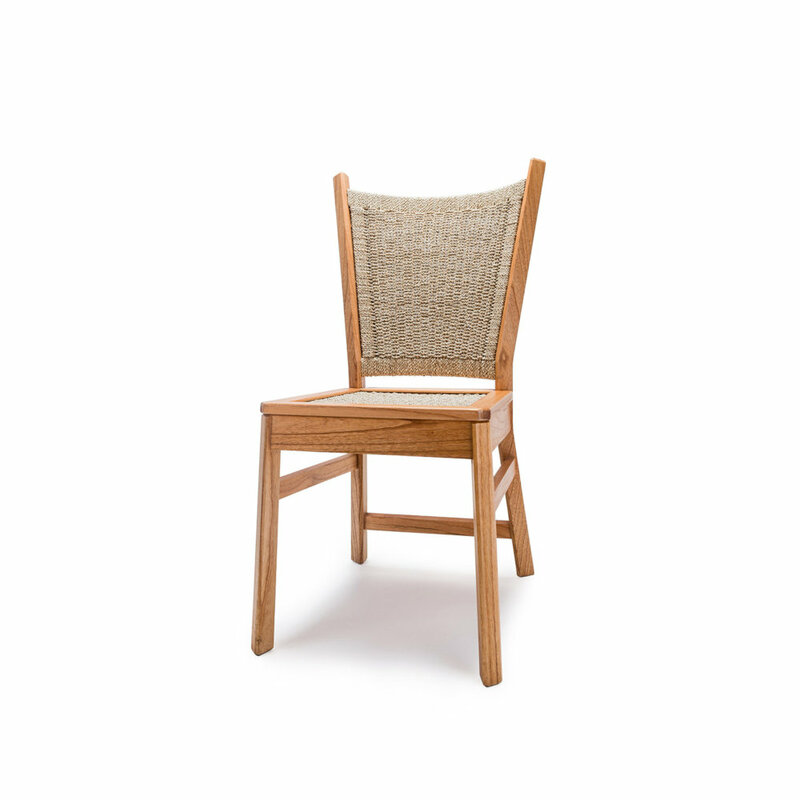 The 2 main Jogya chairs feature Tord Kjellstrom’s unique asymmetrical design: with one side high, the other low. 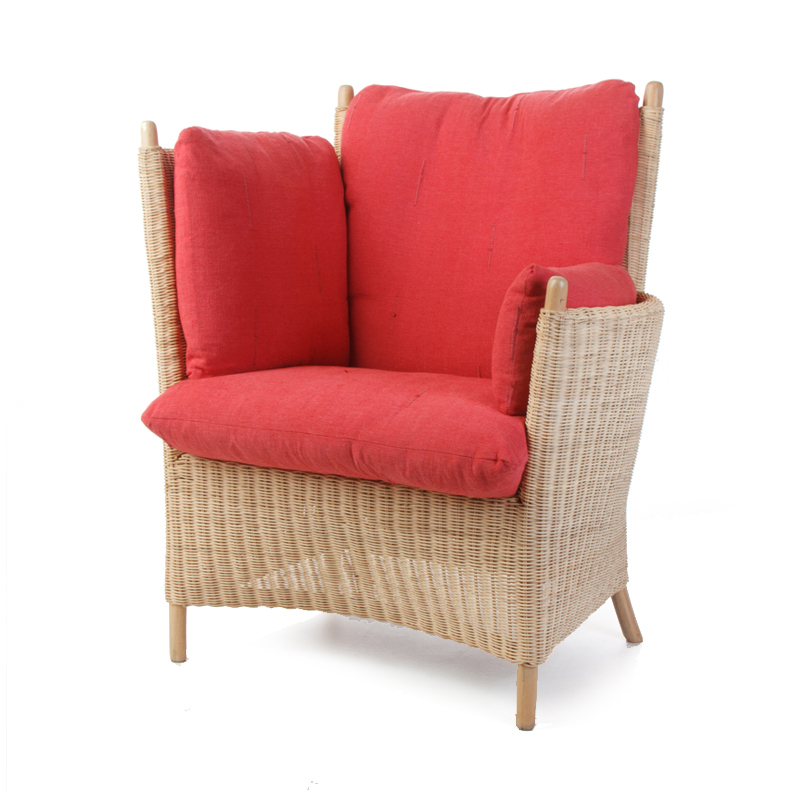 The high side provides a cosy corner for you to snuggle into, while the low side is the perfect height for reaching your drink. 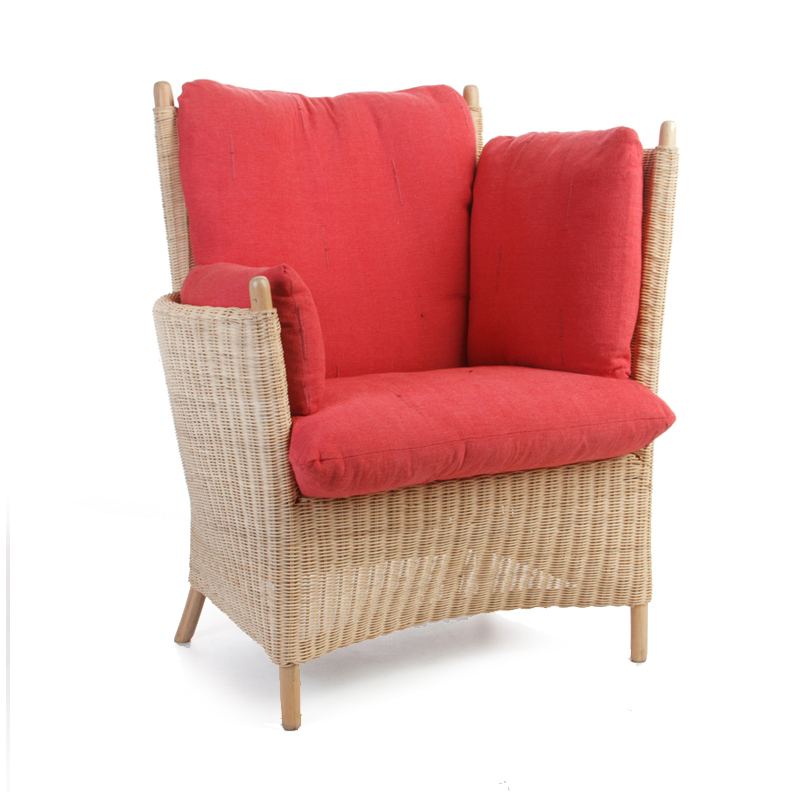 The third chair is symmetrical with low sides; this way it fits neatly between the other two chairs, or can be used on its own, as a single matching throne! 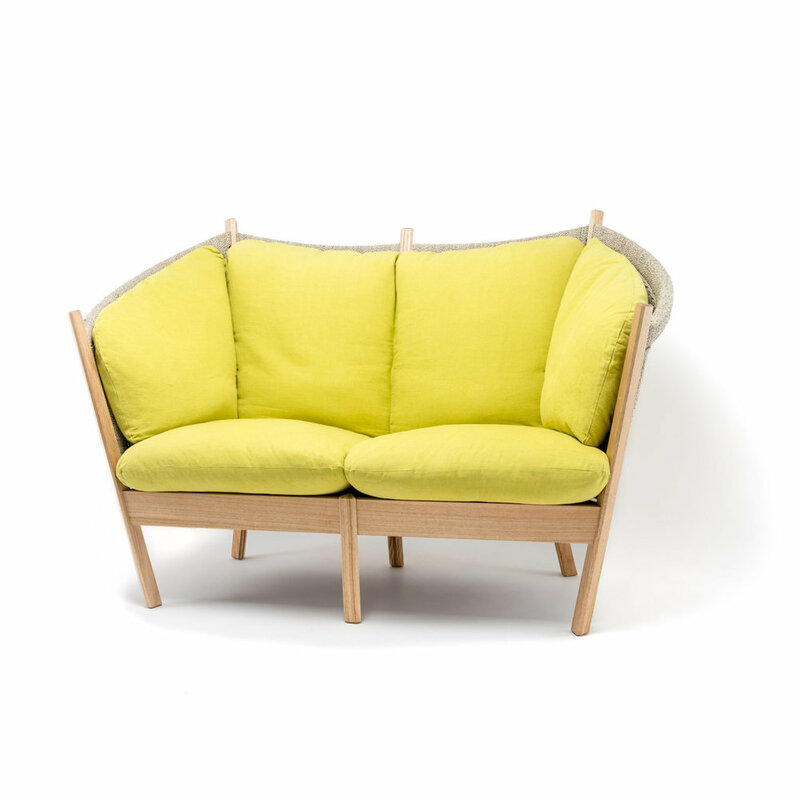 The sofa makes a really comfy space for two people to sit side-by-side, or you can stretch out on it and enjoy a chaise-longue effect. 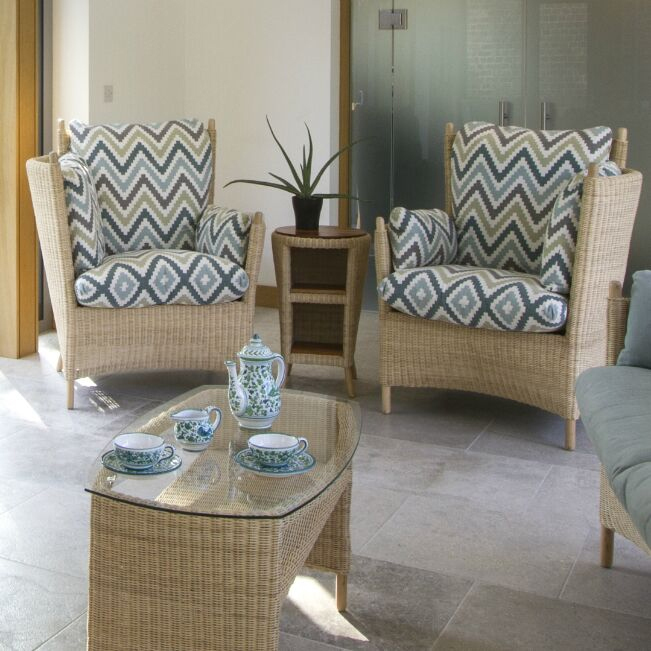 The side table sits neatly between the two chairs – whilst the coffee table works nicely in front of the sofa. 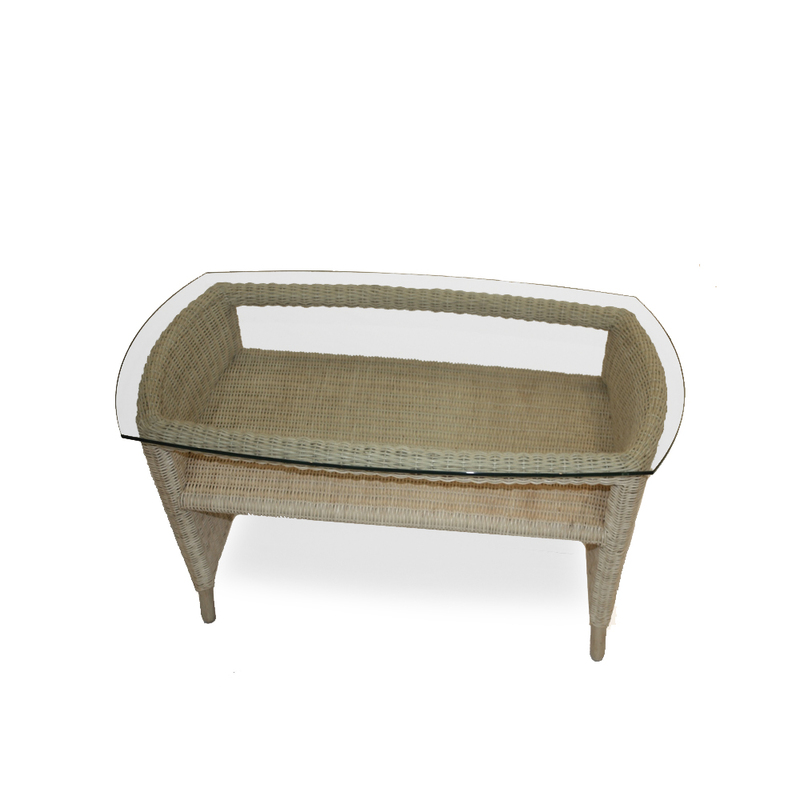 The footstool adds a touch of real luxury to the sitting experience; it is also good as an occasional seat, or as a low table with the cushion removed.